Completely not on purpose, I realized Little Miss' lunch for tomorrow has the makings for the "Today I ate a Rainbow" chart almost covered - yes! 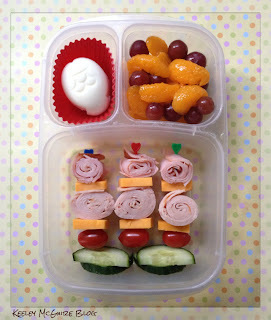 On three hear picks, Little Miss has gluten free ham and turkey slices, rolled up along with Colby cheese bites. At the end of each pick are cherub tomatoes and under that cucumber slices. In the upper left, there's a hard boiled egg done in her fish egg mold. Upper right is a fruit medley of mandarin oranges and grapes. For breakfast tomorrow, Little Miss will have a slice of Udi's cinnamon raisin bread (gluten, nut, soy, & dairy free) with SunButter on it along with some Chobani Champions Greek yogurt. Snack for daycare will be a banana, as mentioned above, and caramel apple EnjoyLife chewy bar. What a yummy looking rainbow it is! We ♥ rainbow lunches too. Love how your lunch look! Love your ideas here! Where did you find the longer sized picks you used here? Most are too short. Hi Jen! The ones pictured I actually purchased in a large pack from the Dollar Tree! (Can't beat $1!!) Also, try BentoUsa.com (AllThingsforSale) - there's a link in my side bard and under the lunchbox goodies tab!